While it isn't an outright apology, the letter definitely leans that way. Some interesting notes to take from the letter is that they are committed to bringing a better AIR MILES experience. The key word is experience. What does that mean? Based on the the additional steps in the letter its better customer service, better communications and such. But no where does it say they are going the make the program itself better and there is good reason for that. They have already told us they need to make up for the lost economics due to not being able to expire our miles. According to some reports they have already increased some redemptions and we just have to wait and see what will happen to other redemption option prices. But of course no mention of actually making the program better in the letter of this gives AIR MILES free reign to do what they like with the actual program. I like how they throw in that last year they delivered more value in rewards than any other year... no duh! You had everyone panicking and they all redeemed for things they didn't want. That's why they delivered 'more' value in rewards. Looks like AIR MILES is still trying to pull the wool over our eyes. 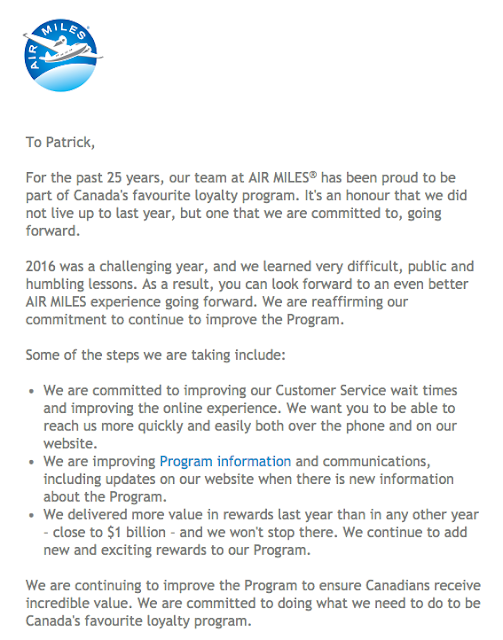 This will be a very interesting year for the AIR MILES program, overall the aura around them is still very negative with consumers however many will still collect and why not. I still collect them, I shop at Sobeys and Shell and will still pull out my AIR MILES card so that I can get something in return, no sense in not collecting them unless of course you shop at non AIR MILES retailers or refuse to visit AIR MILES retailers and I know some of you have chosen that last route! What are your thoughts of the letter and the impression it leaves with you? Are you happy they sent this out? Does it make things better or is it too little too late? Sound off on the latest chapter of the AIR MILES saga by commenting below!